Rugby statistics: Aviva Premiership most competitive league? Rugby statistics: Is the Aviva Premiership the most competitive league in Europe? After the European Champions Cup quarter-finals, Wasps’ director of rugby Dai Young suggested all stats point towards the Aviva Premiership as being the most competitive league in Europe. Is that the case, looking at rugby statistics? The usual arguments put forward are that it is more exciting, has closer matches and has seen four different winners in the previous four seasons. It can certainly be said that there are more tries being scored in the Premiership this season, with an average of 4.9 a game, compared to 4.2 in the Guinness Pro12 and 3.8 in the Top 14. Going back five seasons to the 2010-11 campaign, those figures were 3.8, 3.6 and 3.7 respectively. 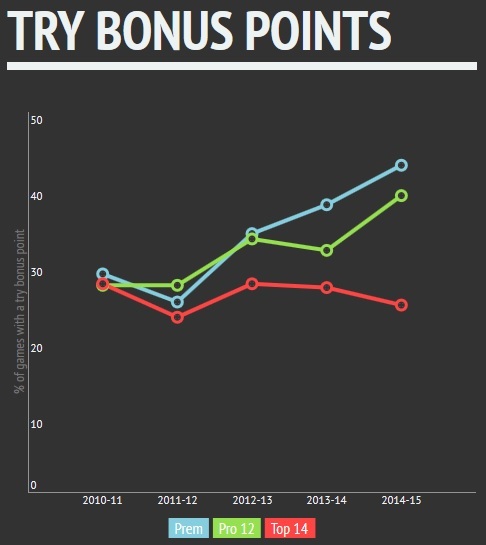 It can also be seen below that the number of games with a try bonus point achieved has increased in the Premiership in recent seasons, with 43% the current rate in 2014-15. There are problems with trying to compare the three main leagues in Europe though given the differences in funding, ownership, format, officiating. 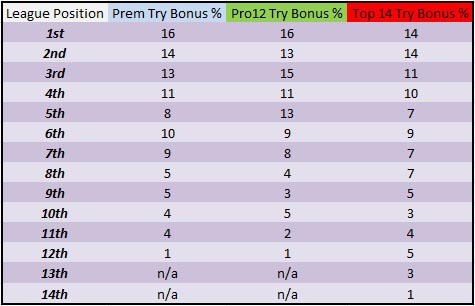 Relevant to the above diagram, the Top 14 uses a different system for both try and losing bonus points. Instead of earning an additional point for scoring four tries, a team in France needs to score three more than an opponent. As of this season, a losing bonus is obtained by finishing within a margin of five points instead of the traditional No 7 too. Allowing for that caveat, there hasn’t been a huge difference in which teams in the respective leagues have picked up try bonus points in the previous five seasons. In the Premiership, teams finishing first to seventh are responsible for 81% of try bonus points in this period, while those same positions account for 85% in the Pro12. In the Top 14, positions first to eighth make up 79% of the total scored. In terms of team representation, in the Premiership the four sides with the most try bonus points in this range – Leicester Tigers, Northampton Saints, Saracens and Bath account for 52% combined. In the Top 14, Clermont, Toulon, Toulouse and Montpellier have scored 52% between them while in the Pro12, it is 55% for Leinster, Ulster, Munster and Glasgow Warriors. There have been four different Premiership winners in as many seasons, but it is worth noting that Leicester, Bath and Wasps account for 22 of the 27 league titles since the formation of a top flight league. The Pro 12 has seen five different winners in 13 seasons, while the Top 14 has been won by seven different teams since 2006. Leicester, Saracens and Northampton have all made the play-offs for five straight seasons, with the other spot rotating between Bath, Gloucester and more recently Harlequins. The Premiership can point to former champions Harlequins and Leicester currently being outside the top four and the rise of Exeter Chiefs as evidence of unpredictability this season. But along similar lines, back in August not many would have called a Castres relegation battle, Oyonnax sitting in sixth place or Leinster being ‘doubled’ by the Newport Gwent Dragons and potentially missing the semi-final stage. While that was true in Europe in the 2011-12 and 2012-13 seasons with 56% and 51% of matches being decided by one to seven points or drawn, there has been a decline this season. An explanation for that reduction in close games and also the increase in tries scored is likely the effect of London Welsh. They have lost all 19 matches, by an average score of 10-46 and conceded 125 tries. Remove their matches this season and that 40% figure of one-score games becomes 48%. One of the arguments against relegation is that it encourages a ‘safety first’ attitude towards matches, with teams looking to secure their presence in the league at the expense of attacking rugby. With Worcester Warriors losing 17 consecutive matches in 2013-14 and London Welsh 19 this season, that threat of losing league status hasn’t existed for the majority of teams in the previous two Premiership campaigns and that has perhaps encouraged ambitious play. There was a 71 point gap between the top and bottom teams in the Premiership last year and 66 so far in 2014-15. In contrast, the Top 14 has gone from a 75 point gap between the teams finishing first and last in 2012-13, to 47 last season and just 30 this year. Promoted teams in France receive better funding than their English rivals, as evidenced by transfers such as George Smith to Lyon or Conrad Smith to Pau. As covered on this site in January, there has also been a change in mindset in the Top14. While the home win rate this season of 77% is still higher than the Premiership (63%) and Pro 12 (64%), upsets such as Oyonnax’s triumph at Clermont or Grenoble winning at Toulouse are becoming more common. Given the importance they have placed in close games as a measure of competitiveness, it isn’t a surprise that the subject of ringfencing is back on the Premiership agenda. Until that issue is resolved, it might be that the much-maligned Top 14 can claim the title of most competitive league in Europe instead.